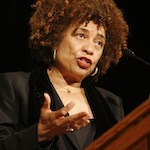 Angela Davis addressed a crowd at Gallaudet University Thursday. She has been a seminal figure in the civil and women’s rights movements for decades, but educator, feminist and human rights activist Dr. Angela Davis still remains deeply involved in movements for social justice globally. Davis, Distinguished Professor Emerita of History and Consciousness and Feminist Studies at the University of California, Santa Clara, told a standing-room-only crowd at Gallaudet University in Washington, D.C., that democracy cannot work if it’s confined only to a small segment of the population. 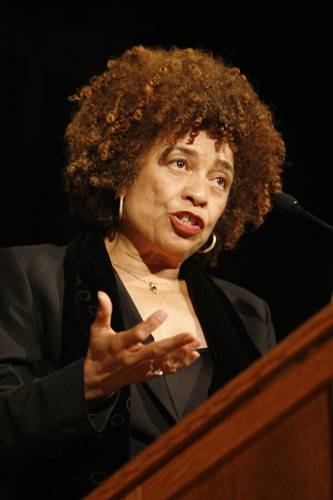 Throughout her more than hour-long lecture on February 14, Davis linked the social, racial and political environments in the United States in the 1860s, the 1960s and the present day, showing the continuous thread and threat of racism, violence, sexism and discrimination to women and people of color. Davis, the author of nine books, was invited to the campus by the Gallaudet University Office of Diversity and Inclusion as a part of Black History Month. Her presentation, titled “The Indivisibility of Justice,” is part of the Diversity Lecture Series. The Birmingham, Ala., native signed books at a reception following the lecture. She reminded the audience of the importance of Black History Month, tying it to struggles for freedom everywhere. Davis spoke in detail about intersectionalism, a term that means that people fall under different categories such as gender, race and sexual orientation. She encouraged the audience to reach across these barriers to talk, find common ground and also to militate and agitate against America’s capitalist and imperialist tendencies and actions that invariably hurt and marginalize women and people of color. She noted that the women’s and gay rights’ movements were inspired by those in the civil rights movement who fought to topple segregation and discrimination in the 1950s and ‘60s. She discussed the importance of the Emancipation Proclamation and the 13th amendment and generated audience laughter when she gently derided the Emancipation Proclamation. Lincoln, Davis said, was a shrewd man who knew that many of the enslaved Africans who were freed would fight, and fight vigorously for the Union Army. Davis lamented that most Americans know little about Reconstruction, the period right after the Civil War that saw Blacks assume political office, introduce new laws and progressive laws for women that allowed them to own property and become deeply involved in the struggle to provide education for all children in the South. Davis said that the 13th Amendment, which outlawed slavery and voluntary servitude, is a critically important law that she credits Lincoln for. She told listeners that, because of the contradictions she deals with in feminist studies, she’s quite comfortable calling Lincoln great for passage of the amendment while realizing that he supported the idea of sending all Blacks in America back to Africa. She said it’s fanciful to believe that, by simply signing a document freeing slaves, all the attendant strains of racism, discrimination and related ills would disappear. But what followed was a violent backlash against Reconstruction with the emergence of the Ku Klux Klan, and the introduction of the punishment system in the form of massive prison plantations, the convict lease system and Jim Crow, Davis said. These practices were the precursors to the prison industrial complex that envelopes the United States at present, she said. The disestablishment of the welfare state and human services, the transfer of capital to profitable sectors of the economy, the decision by the political elite to abandon everything else and the privation of education, health care and the prison system are some vital reasons for the development of the prison-industrial complex, Davis added. “It’s the need to control and manage unemployed Black bodies,” she said. While the US comprises 5 percent of the world’s population, Davis said, 25 percent of the [world’s prison] population—2.5 million people—is incarcerated, and one in every 37 people are under the control of criminal justice agencies. Davis said she is dedicated to dismantling the prison industrial complex and called on the audience to form mass movements to assert their rights and bring about change. Mistress of Ceremonies Elena Ruiz was ecstatic after the lecture.